It just so happens that, with the holiday season fast upon us, a stack of gift-worthy publications has landed on The Independent‘s Books & Lectures desk. Perhaps your family has an uncle with a passion for American history, a mom enamored with Sting, or kids running around with senses of humor too advanced for their own good; whatever your relatives’ interests, someone’s certain to tear open the wrapping and find the perfect wintertime present in one of these new books. While Harper Perennial’s Best American books rarely fail to contain outstandingly entertaining and informational pieces, the Best American Science Writing series maintains the highest standard fascination quotient. 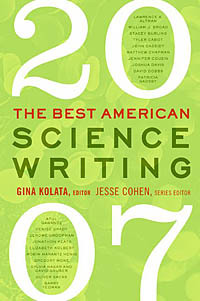 Make a gift of The Best American Science Writing 2007, edited this year by the New York Times‘ Gina Kolata, and the recipient will read Atul Gawande on the science of childbirth, Denise Grady on laser brain surgery, and Sylvia Nasar and David Gruber’s “Manifold Destiny,” an account of Fields Medal winner (and refuser) Grigori Perelman’s work on the Poincare conjecture. The last of those, in your columnist’s opinion, is the finest article to grace the New Yorker’s pages in the last decade. Then again, your columnist is admittedly a big fan of higher mathematics. 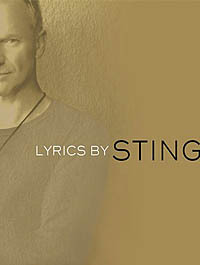 If, however, nobody on your list wants to read about the greatest topological problem of our time, perhaps they’d prefer a book of lyrics by Sting. A suitable gift, then, would be Lyrics by Sting, a handsomely produced collection of all the words to Gordon Sumner’s oeuvre, from the obscure numbers to the megahit tracks that will receive airplay until the heat death of the universe. Die-hard listeners will pore over the explanatory paragraphs penned by Sting himself: Some are insightful, some are cryptic, and some are just plain goofy. When the poring is over, the book can handily settle all disputes about misheard lines. “Fields of barley” or “fields of holly”? “Illegal alien” or “lethal idiot”? These are the questions Lyrics by Sting puts to rest. 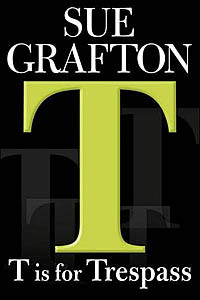 Irrepressible detective novelist and Santa Barbara resident Sue Grafton is at it again with T is for Trespass, the twentieth installment of her alphabetically inclined Kinsey Millhone series. Over the past two decades, Grafton has honed her skill at appealing to longtime enthusiasts of the genre without losing the battle against predictability; things are never quite the same twice in Santa Teresa, her protagonist’s California hometown that’s suspiciously similar to Santa Barbara. The year is 1987, and Millhone is engaged in the daily grind of slow, methodical surveillance gigs, the sort of cases that keep your average private detective fed between the truly gruesome, sinister ones. As fate would have it, something gruesome and sinister soon rolls into town in the form of Solana Rojas, a homicidal nurse to the elderly with an eye on Millhone’s geriatric neighbor. Can our intrepid heroine defeat this menace to society while juggling her regular workload? To find out, borrow the book from whomever you give it to. 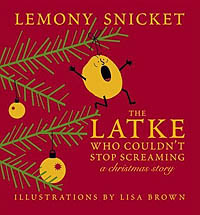 For the kids, and especially the kids who aren’t quite up to Lemony Snicket’s A Series of Unfortunate Events, there’s the same author’s The Latke Who Couldn’t Stop Screaming, a brief holiday story that applies equally well to both Christmas and Hanukkah. Why can’t the titular latke stop screaming? First and most obviously, it’s the pain of being fried in a pan. After making a break from said pan and hitting the road, he screams because everywhere he goes, he’s assumed to be a participant in Christmas despite his status as an icon of Hanukkah. This string of misunderstandings ends when the latke encounters a hungry, presumably Jewish, family. Snicket’s signature prose, at once grand, flat, and absurd, is present in full force, as is the arch house style of publisher McSweeney’s. While parents may disagree about whether to expose their children to a tale so steeped in irony, the clear, bold illustrations by Lisa Brown will elicit chuckles from family members of any age. Though it’ll never fit into your average stocking, Judith Dupre’s Monuments makes a fine gift for those big on photography, architecture, history, or any combination of the three. The book gathers images, facts, and interviews about the statues, buildings, monuments, and quilts that both shape and reflect our collective perception of the events of the United States of America’s past and the values that guide the country into the future. 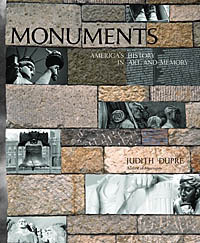 Dupre’s work covers the most monumental of the monuments-the Liberty Bell, the Vietnam Veterans Memorial, the Lincoln Memorial-as well as more recent constructions such as the Heavenly City, the Irish Hunger Memorial, and the Luminous Manuscript, all on intricately designed pages in striking black and white.